What is Grant Maximizer™ Solution? Grant Maximizer™ is a customizable grant management software solution comprised of five modules – GrantMax™ Pre-Award, GrantMax™ Budget, GrantMax™ Reconciler, GrantMax™ TimeTracker, and GrantMax™ Evaluation. Grant Maximizer™ was designed specifically to help grant directors manage the tedious administrative tasks related to their grant. Grant Maximizer™ offers the ability to manage goals, objectives, and benchmarks and ties individual activities to the same. Grant Maximizer™ also provides the ability to create, modify and manage budgets at high levels of detail and in multiple formats – by account code, funding source, site and even activity. Grant Maximizer™ tracks grant revenues, expenditures, and performance at those same levels of detail. GrantMax™ TimeTracker provides a place to capture time associated with activities, not only for participants but also for providers which is used in calculating and tracking salary expenses. Grant Maximizer™ offers easy-to-use data entry, customized reporting and, most importantly, the ability to tie expenses to specific activities. Grant Maximizer™ allows administrators to quickly assess the financial effectiveness of the grant’s goals, objectives and related activities. Grant Maximizer™ Solution can be used in conjunction with QuickBooks® Premier Edition* accounting software and third-party recipient data tracking companies. Grant Maximizer™ is a total package of consulting, system analysis, software configuration, training, and follow-up support. The cost is based on the number of grants you are tracking and how many sites are involved. Contact us today for an initial consultation. Does Grant Maximizer™ replace my primary accounting system? 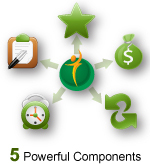 Grant Maximizer™ is not meant to replace the primary accounting systems of most organizations. It simply replaces the manual and spreadsheet methods that many Grant Administrators use to track grant-related expenditures. However, for small organizations, Grant Maximizer™ could prove to be a viable alternative to more expensive, off-the-shelf accounting solutions. Can Grant Maximizer™ track matching contributions? Yes, Grant Maximizer™ can track and report on the various types of matching contributions. Activity reports can be created to reflect ALL costs associated with the activity — grant-funded AND matching contributions. Can Grant Maximizer™ track indirect costs? Can Grant Maximizer™ track multiple budgets at the same time? Can Grant Maximizer™ report on different fiscal years? Yes. Often, the grantor’s fiscal year end will be different from the fiscal year end of your organization. Grant Maximizer™ provides for easy reporting to accommodate this requirement. Can Grant Maximizer™ help to manage goals, objectives, and benchmarks and relate the associated activities? Yes. Grant Maximizer™ provides a forum to manage goals. objectives and benchmarks. Activities are associated with goals and objectives in order to establish cost-effectiveness. If required, Grant Maximizer™ allows for data imports from third-party participation tracking systems for more in depth analysis. What type of support comes with Grant Maximizer™? Our accounting professionals provide consulting, training, and ongoing support to ensure that your staff is properly equipped to realize the full potential of the Grant Maximizer™ system.